LexisNexis Legal & Professional, a leading global provider of information and analytics, saw its LexisNexis South Africa operation announced as Winner of the prestigious Innovation through Technology award at the 15th annual National Business Awards, held on 16 November at Emperors Palace. The company was up against impressive contenders including runner-up AECOM, Sentech and Dell Computers. This achievement at the renowned Oscars of South African business resulted from the unanimous verdict of the awards’ Judges, a collective of industry heavyweights. LexisNexis was accorded the award before a host of business and government leaders, VIPs and media representatives. Also watching, via live social media updates, were thousands of South Africans whose engagement kept the awards trending for several hours. This year’s 15th anniversary awards marked a decade and a half of showcasing the achievements of both companies and individuals (CEOs, entrepreneurs) at the forefront of South Africa’s economy in tandem with prestige publication Top Performing Companies. While creator and host Top Media and Communication’s use of integrated digital data analysis tools has grown exponentially since the first National Business Awards, in terms of qualifying and ranking award contenders, it is still professional, human interpretation of quantitative and qualitative data – by both Top Media’s Research division and the awards’ Judges’ panel – which ultimately confirms the outcomes. 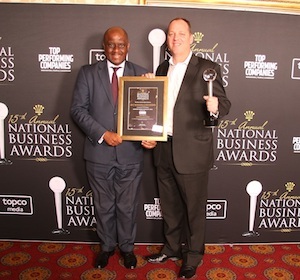 Respected speakers at this year’s awards included Norman Mbazima, Deputy Chairman of Top 500 Company of 2017 Anglo American SA; Professor Emeritus Brian Kantor, economy stalwart, thought leader and author of Get South Africa Growing, and group co-CEO of The Creative Counsel Ran Neu-Ner – himself the winner of the Top Performing Business Leader trophy at last year’s ceremony. For more information on LexisNexis South Africa’s accolade and its dynamic solutions, visit www.lexisnexis.co.za.